Did you make this week’s blotter? 2:26 a.m.: UPD responded to an alcohol overdose at Greiner Hall. The student was transferred to Millard Fillmore Suburban Hospital. 7:47 a.m.: A caller notified UPD of a motor vehicle accident at Sweet Home Road. UPD issued a traffic summons and the vehicle was towed. 3:37 p.m.: A caller requested UPD’s assistance with their vehicle on Rensch Road. The vehicle appeared to be out of gas and its flashers were not working. The vehicle was towed. 5:50 p.m.: UPD served suspension papers to a male student in the Fargo Quad. 7:52 a.m.: UPD responded to a motor vehicle accident on Hadley Road. UPD issued a traffic summons. 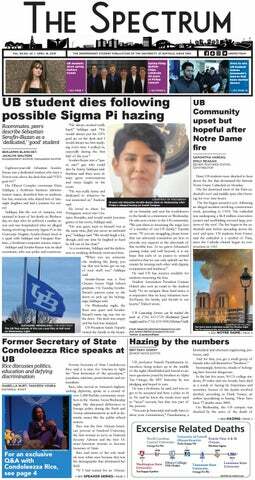 8:00 a.m.: A student found a suspicious photo in Alumni Arena. Upon further investigation, the photo appeared to not be criminal in nature. UPD filed a report. 2:12 p.m.: UPD responded to a larceny on Core Road. A female student reported her hoodie which contained her house keys was stolen. The female students last reported seeing her items around 1 p.m. She found her hoodie around 4:04 p.m.
3:02 p.m.: A female student notified UPD that her ex-boyfriend was harassing her. The student filed a report. 2:55 p.m.: UPD responded to a disturbance call in Fronczak Hall. UPD advised a group of students to turn down their music. 5:37 p.m.: UPD provided assistance to a disabled motor vehicle on Bailey Avenue. The vehicle was moved to the Michael-Farber Lot. UPD cleared with a report. 9:41 p.m.: UPD responded to reports of suspicious people at UB Stadium. Both suspicious suspects were in the stadium. Both suspects were arrested. 12:59 a.m.: A male student reported a marijuana complaint in Hadley Village. The student reported seeing drug paraphernalia on a table. UPD was unable to determine who the paraphernalia belonged to and confiscated the marijuana for destruction. 2:06 a.m.: A caller reported a suspicious male entering the back door of Clement Hall. The suspect appeared to be wearing a white shirt and jeans. He was reportedly sprinting through the parking lot and appeared to be holding something in his waistband. The offender was gone upon arrival. 5:39 a.m.: UPD responded to a call from an RA in the Red Jacket Quadrangle building. A female student reported being in an ongoing dispute with her roommate who has been harassing, threatening and shoving her. A referral was filed and UPD cleared with a report. 10:16 a.m.: UPD responded to a larceny on Webster Road. Someone stole three helmets from UB Stadium room 120 at or around 2:30 p.m. on Nov. 3. UPD filed a report. 12:13 p.m.: UPD responded to a possible fight at Alumni Arena near the refreshments stand. UPD checked the area and the offenders were gone upon arrival. 4:13 p.m.: UPD provided assistance to a larceny at Alumni Arena. A patron stole the victims wheelchair while attending a cheering competition. The wheelchair was returned to the rightful owner. 7:01 p.m.: UPD issued a warrant and arrest at Sisters of Charity Hospital. Buffalo City Police reported they had a subject who had a warrant for their arrest at a traffic stop. UPD canceled the warrant upon the subjects’ arrival at Bissell Hall. 10:41 p.m.: UPD responded to a call at Hadley Village and conducted a welfare check. The subject was transported to Erie County Medical Center. 10:54 p.m.: UPD responded to a larceny call from Goodyear Hall. A female student claimed her roommate stole her full-body mirror when moving out. The two roommates had ongoing issues. UPD spoke with both parties and filed a report.